Maira Sutton: Brian Eno rejected the lone genius myth — the idea that groundbreaking works of art arise out of a notable few graced with exceptional talent. Instead, he observed that good artwork doesn’t miraculously emerge from a few great figures, but from relationships. He coined the term “scenius” to reflect the genius that arises out from social relationships or “scenes” of novel creativity and thought. History provides ample proof. For as long as there has been art, artists have worked together to support each others’ projects and sustain their livelihoods. Early examples include the medieval guilds of Europe, where artisans such as stonemasons and glaziers worked together to meet their common needs. Artist collectives have also been around for centuries. Contemporary versions range in size from just a few members to scores who produce art individually or collaboratively and exhibit their works in shows together. The tradition of artists banding together is alive and well today. Below are three examples of artist forming worker cooperatives to support themselves and their work at a time of increasing economic precarity. Photo: Screenshot of Stocksy United’s home page, a collage of sample curated images. Stocksy’s forbearer was the for-profit stock photo company, iStock — which even back then was an enterprise that prided itself in being “by creatives, for creatives.” In 2006, the company was sold to Getty Images for $50 million. Under the new ownership, fees to photographers were cut and the culture of artistic camaraderie vanished. A few years later, the founders of iStock decided to use the money from the sale of iStock to form Stocksy, a stock photo site formed as a worker cooperative owned and governed by its contributing photographers. This would ensure photographers were paid fairly and had a say in the business over the long term. Their origin story is unique, since it’s rare for a digital media platform to share ownership and governance with its contributors. The funds from the sale of iStock certainly made it easier to launch Stocksy, but the key was the pre-existence of the iStock photographer community that was eager to build and own an enterprise together. Other artists may not have the same access to capital or community as Stocksy. Two more co-ops, CoLab and Meerkat Media Collective, demonstrate other ways in which creative professionals can come together to form their own thriving, collectively-owned businesses. Photo: Members of the the CoLab cooperative in their office. CoLab is a worker-owned digital agency that designs and develops websites and apps for mission driven organizations and entrepreneurs. It was founded in Ithaca, NY in 2010 by Rylan Peery and Ralph Cutler. Peery had studied co-ops as a Stanford undergraduate, during which he spent over a year and a half visiting cooperative businesses across Latin America. In the late 1990’s, he worked in venture capital and raised money as a tech start-up entrepreneur. Of these two experiences, Peery says that he became “keenly aware of the limitations and challenges of the conventional technology start-up paradigm,” and that he “carried seeds of a possible solution inspired by the sustainable economic development work” from his exposure to cooperative systems during college. In 2009, Peery and Cutler began collaborating on some design projects. It became clear that they shared the same vision for the kind of creative agency they wanted to build. So in 2010, with the help of co-op development resources and a supportive community, they converted Peery’s traditional business into a cooperative. Since then, CoLab has grown to more than 25 workers and worker-owners. They’ve met potential members through meet-ups, conferences, co-working spaces, and the like. Once they found a promising candidate, they’d collaborate on a project to know them and see if it was a match. “From there everything can flow quite organically into co-op membership, but the fundamentals of being open to exploring new connections and relations is the foundation,” Peery explained. As a cooperative, they make all of their decisions democratically through a three-fold process: working group meetings on specific project issues, board meetings for decisions that require the involvement of all their members, and the Loomio app to make day-to-day decisions. Overall, they strive for a “lean democracy” where all members can participate in governance or are represented by designees. They also offer leadership training for all members to better support a democratic workplace. The team at CoLab plans on a further expansion of their cooperative enterprise by creating a performance arts and studio co-op in Ithaca that merges visual and interactive arts. Image: Still from Meerkat Media Collective’s short documentary about the People’s Climate March called Into the Streets. 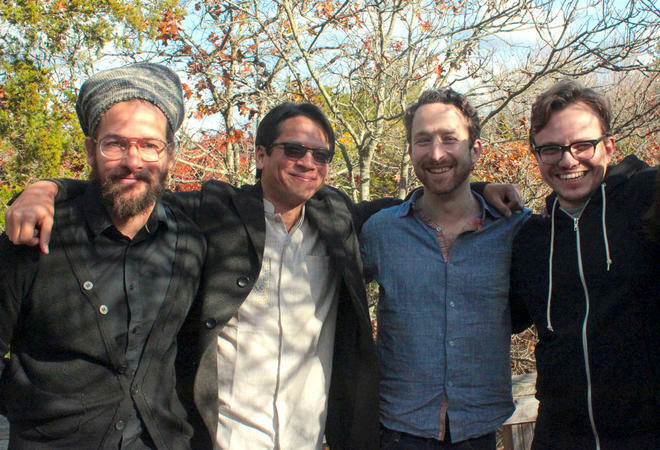 Across the state from Ithaca is the Meerkat Media Collective in Brooklyn New York. Meerkat started as an informal collective in 2005 between 12 college friends who all had backgrounds in film and activism. The collective started as a means to share resources and support each other through their individual freelance video projects. While each filmmaker succeeded in their respective careers, they wanted to find a way to funnel the money they received from their hired contracts into their own individual passion-projects. They had been working as a collective, but they didn’t have a shared bank account or operating budget. That’s why Meerkat Media Collective eventually became a more formal collective of artists-in-residence and a worker cooperative film production company. Their projects include documentaries and web videos for publishers, universities, and non-profits. As they strive to produce high-quality films for impact, they also provide their members with a sustainable income and humane work environment. The co-op arm of Meerkat was launched by half of the original collective’s members in 2010. The six founders incorporated as an LLC where each of them became equal partner-owners of the enterprise. Co-founder Zara Serabian-ArthurIt told me that it was easy for them to transition into a co-op because the founding members had already been making films together in a collaborative way. Their collaborative way of doing things has evolved to the point that they rotate roles for any given film between director, editor, and shooter. Unless a client specifically requests a certain style, which may be one of the members’ unique strengths, they do this rotation to make sure all of their skills continue to develop and that no one gets pigeonholed into one role or style of filmmaking. Their residency program is made up of independent artists that actively work on film projects, individually or collaboratively, with the collective’s support, resources, and equipment. Residents also support each other’s projects, receive a monetary stipend, and attend an annual creative retreat. The residency program and co-op have a strong reciprocal relationship. The program is funded by the co-op and residents have access to shared office space and equipment. In turn, the residency offers the co-op access to a new talent. The Meerkat co-op makes most of their collective decisions through meetings, which happen at least three times a week. They hold a full-day strategic planning meeting once a month, and for small every day issues, they also use the decision-making software Loomio. Despite this legacy of art collectives, navigating the process of setting up a cooperative enterprise is a new and complicated process. The founders of CoLab and Meerkat Media both mentioned how helpful it was to have some guidance from the outside. Peery and Cutler worked with LIFT to get coaching on the vision of their organization, and said it was one of the reasons they were able to make the leap from traditional business to cooperative. Support has also come from local government. In 2014, New York’s City Council voted to support the development of worker-owned businesses and directed $1.2 million dollars towards expanding existing worker co-ops and developing new ones. The Worker Cooperative Business Development Initiative funded training plus technical, legal and financial assistance to current and potential co-op members. According to the Democracy at Work Institute, it was the largest U.S. city investment in worker cooperatives to date. In 2015 the Council invested an additional $2.1 million into the initiative and in one and a half years, tripled the number of worker co-ops from 20 to 67. Due to such resounding success, the City Council renewed and expanded funding for the initiative again this year. Serabian-Arthur of Meerkat Media noted that their co-op directly benefitted from this Initiative, noting that the training and resources that the city has funded, along with the supportive cooperative ecosystem that has emerged alongside the New York City trade association for worker co-op businesses, have been extremely helpful to keep them going.